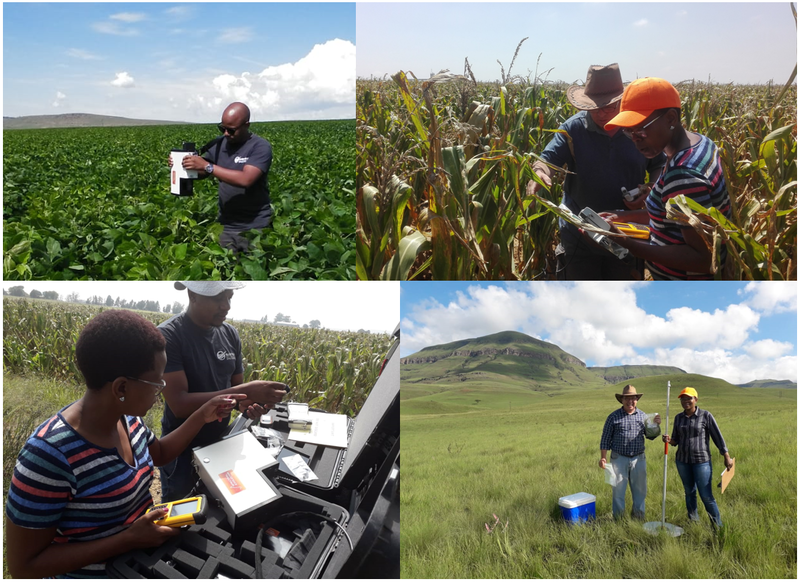 SANSA have been engaged in Calibration and Validation (CAL/VAL) activities in Harrismith, Bothaville and Cathedral Peak Pilot sites in Free State and KwaZulu-Natal during March and will continue into April 2019. The aim of the CAL/VAL activities was to ensure the accuracy and credibility of Earth observation based products and services developed as part of AfriCultuRES Project (774652). The African AgriCultural Systems with the support of Remote Sensing (AfriCultuRES) project aims to develop an integrated agricultural monitoring and early warning system that will support decision making in the field of food security in Africa making it critically important for South Africa. This is achieved by providing a range of climatic, production, biophysical and economic information, for various regions in Africa. SANSA uses non-destructive methods (i.e. no plant or soil materials are harvested during sampling) to study the crops and veld conditions, by measuring the canopy reflectance, leaf area index, biomass and chlorophyll content. This project received funding from the European Union’s Horizon 2020 Research and Innovation Programme under Grant Agreement No. 774652. The study is a collaboration with organisations across Africa and Europe, and the pilot South African study sites are in the Free State and KwaZulu-Natal provinces as they are the two main maize production areas of the country.